Has the Low FODMAP Diet left you with some hard-core pizza cravings? With a few easy swaps, delicious, cheesy pizza can be part of your life again in no time. Need some FODMAP friendly topping ideas? 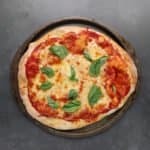 Try this low FODMAP Margherita pizza. Margherita pizzas are one of my favourites. I love the light, simple flavour of the mozzarella and basil on a plain tomato base. Just so you know, gluten-free pizza crusts can be a little dense. I normally roll it into a thin crust to make the texture a little less noticeable. It will still puff up a little around the edges, though. Just so you know, this recipe makes two pizzas. If you want to save a portion of the dough for later, you can put it in the freezer after it rises. Make sure to defrost it for your next low FODMAP pizza adventure. 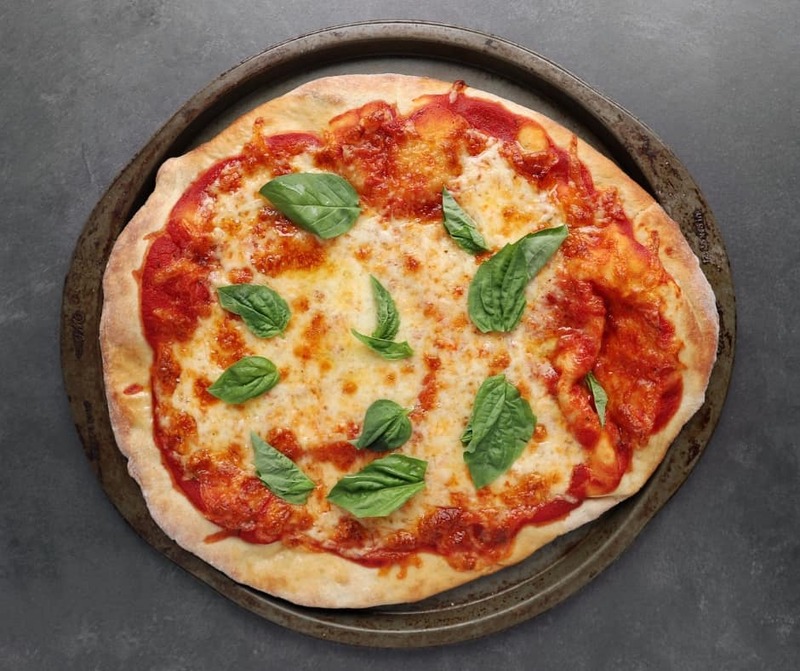 Think this low FODMAP Margherita pizza sounds great, but you don’t have time to try it now? You can PIN THIS POST for later. This low FODMAP Margherita pizza is a delicious way to get pizza back on the menu. Check out the notes below for tips on keeping this recipe FODMAP friendly. First, if you’re in the elimination phase, you’ll need to use gluten-free flour for your crust. For my Canadian peeps, I use PC’s gluten-free flour. If you want to use something else, make sure it doesn’t have gums, since we’re adding our own. This recipe also uses xanthan gum. Even though xanthan gum doesn’t have any FODMAPs, it still bothers some people. If you know you’re sensitive to gums, you might want to sit this recipe out. If you’re not sure how you handle gums, start with one or two pieces of pizza and see how you react before increasing your portion size. Next, you need to choose a FODMAP friendly tomato base. I like to use plain tomato puree. According to the Monash app, 1/2 a cup of canned tomatoes is low FODMAP. We use 4 tbsp per pizza, so you’ll be ok even if you eat an entire pizza on your own. Last but not least is cheese. Hard cheeses are low FODMAP in small servings because bacteria break down the lactose during the fermentation process. This recipe uses 3/4 a cup of grated mozzarella. According to the Monash app mozzarella is safe in servings of 1/2 a cup. So, if you’re planning on having a pizza for one, reduce your cheese to 1/2 a cup of mozzarella, instead. If you want more information on eating dairy products on the Low FODMAP Diet, check out this article by Monash. If you’re planning on sharing your Margherita pizza, you might need to add some side dishes. I normally pair my pizzas with a fresh salad. I like the pop of colour and it keeps my portion size in check. If you need some lettuce inspiration, check out these low FODMAP salad ideas. 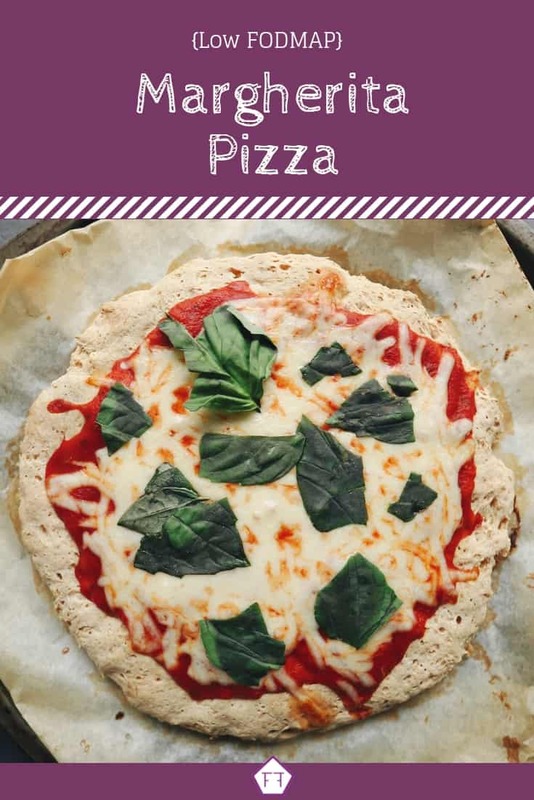 Want to try this low FODMAP Margherita pizza? Don’t forget to PIN THIS RECIPE for later. 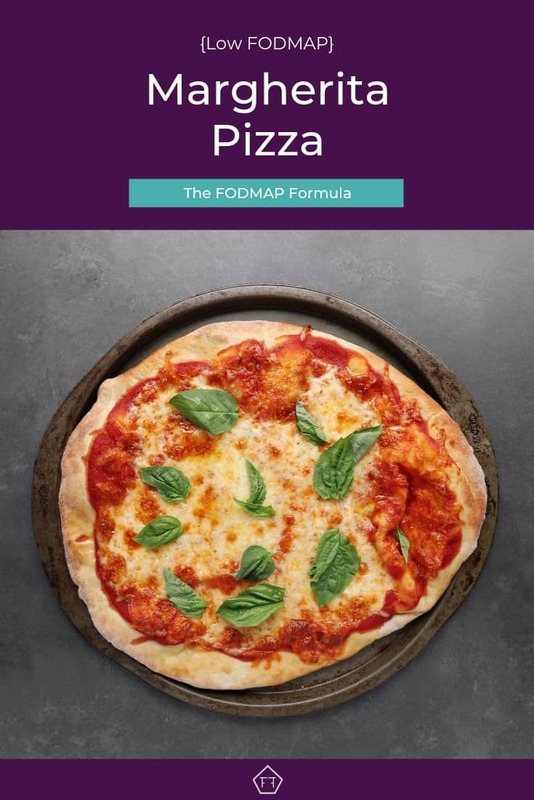 Looking for a FODMAP friendly way to get pizza back on the menu? 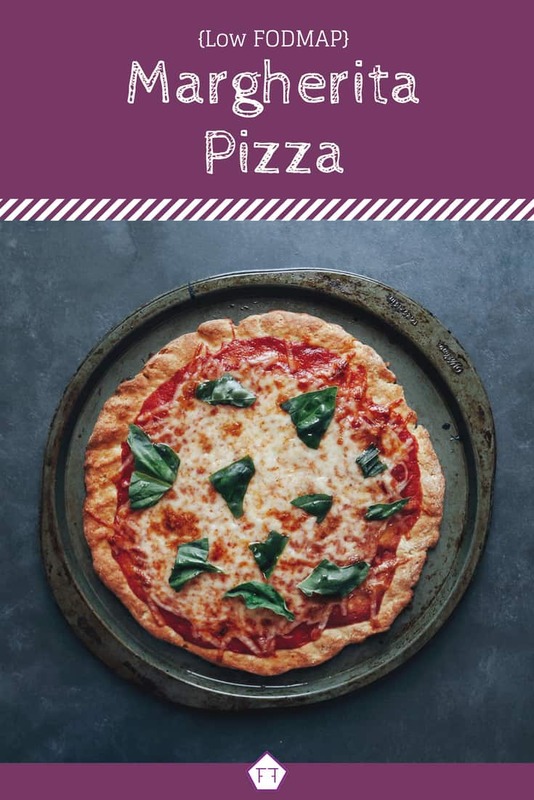 Curb your cravings with this low FODMAP Margherita pizza! Place yeast, sugar, and warm water in a heat-proof bowl and allow it to sit for 10 minutes. The water should become frothy as the yeast ferment. After 10 minutes, add eggs and olive oil and mix thoroughly. Then add the gluten-free flour, xanthan gum, salt, and rosemary. Mix until the ingredients cling together in a sticky ball. Cover the bowl with a damp tea towel and allow the dough to rise on the counter for at least 20 minutes. Preheat your oven to 425 degrees. Split the dough into two parts. Place one-half of the dough on a piece of parchment paper and press it into the desired shape/thickness using your hand. The dough will be very sticky, so you may need to put a piece of plastic wrap over it while you work it into position. Once the oven is ready, place the pizza on a cookie sheet or directly onto a pizza stone. Cook on the lower rack for 15-20 minutes (until the top of the pizza is lightly browned). Then remove the pizza from the oven and cover it lightly with tomato puree. Sprinkle oregano, salt, and pepper, on the pizza sauce, then sprinkle with mozzarella. Place the pizza back into the oven for another 5 minutes (or until the cheese has melted). Once the cheese is melted, remove the pizza from the oven and sprinkle it with fresh basil leaves and a drizzle of extra virgin olive oil. Serve warm. Want to know how to take your Margherita pizza to the next level? Drizzle some extra virgin olive oil on your pizza right before you serve it! I recommend putting it in a small container and drizzling it with a spoon so you don't drown your pizza by accident. This low FODMAP Margherita pizza is an easy way to get pizza back on the menu. If you like this recipe, sign up for my mailing list below. You’ll get more recipes and articles delivered right to your inbox. 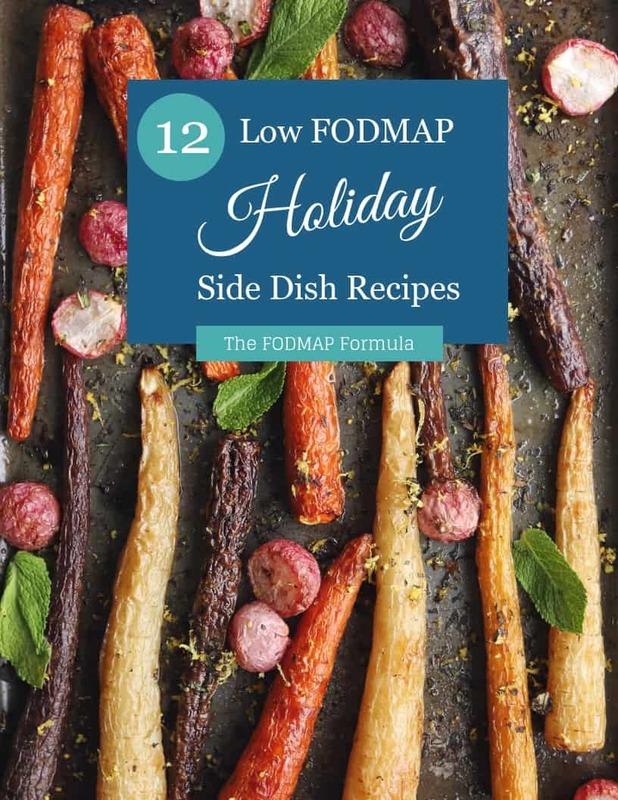 Want more FODMAP friendly dinner ideas? Follow me on Pinterest for even more inspiration. Together we’ll get the Low FODMAP Diet down to a science! First off, thanks for posting this! My S/O requires a low-fodmap diet to help with stomach pains. 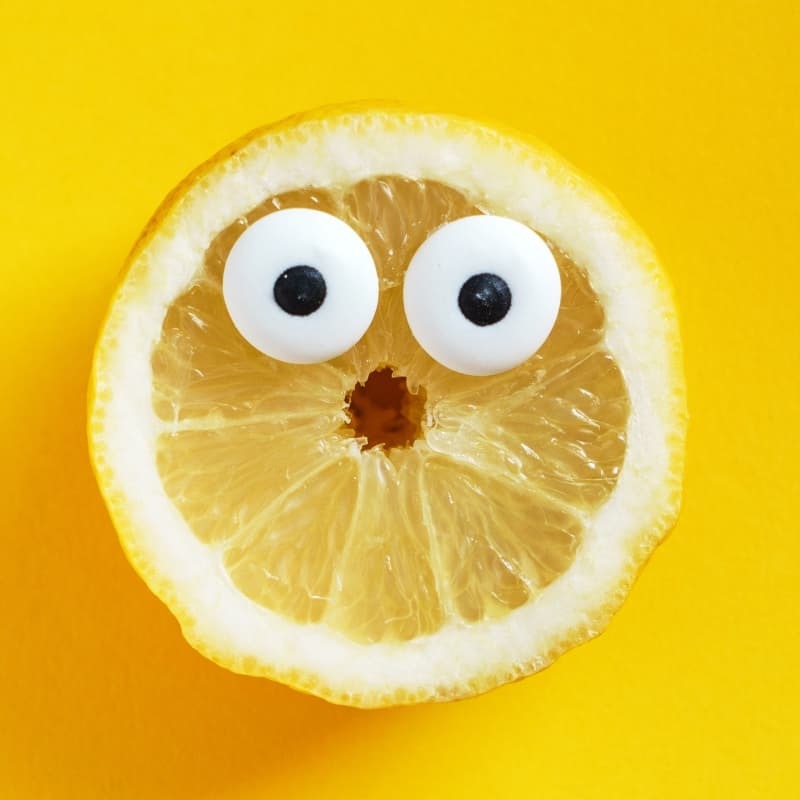 On top of low-fodmap, she is also a picky eater, so it is especially difficult finding things to make that she likes, are good for her body, and low-cost. This recipe was fun to make! I’ve never made gluten-free dough before, it was quite an interesting process (side-note, Xanthan gum is one of the most odd ingredients to discover, it was my first time making any recipes with it). The pizza was really good! The dough was a little tough if you don’t eat it right away. I think if I make it again I might spice up the sauce a bit, and definitely try to press the dough flatter. I’m glad I discovered your site, can’t wait to try some more recipes! I’m a really picky eater as well, so I totally feel your S/O’s pain. I’m glad you both enjoyed the recipe. You’re right about the crust, though. Gluten-free pizza doughs can be ridiculously dense. I normally roll mine into a cracker crust which makes for a much better texture. As for the sauce, if you find the tomato puree too bland, you can try it with my low FODMAP marinara sauce. I hope you have a chance to try more recipes! This is a thin crust pizza, so it’s meant to be on the thin side. If you think it’s going to be tough, you can test the dough when you blind bake it to make sure it’s still fluffy when you put on your toppings. I would have loved this recipe and followed exactly. My pizza dough looked it was crunchy on bottom but raw inside when I took out. I put it in several times to keep cooking it but already had toppings on it and didn’t want the cheese to over cook. Is gluten free bread sort of yummy looking? My bottom of crust looked cooked and crispy. I’m sorry I meant “gummy” looking? Sorry to hear your pizza didn’t turn out as planned! There are a few things that may cause it to turn out “gummy.” First, depending on the type of flour you used, you may need to adjust the amount of water you add to the dough (too much moisture can lead to soggy bread). Next, check the flour you used to see if it already has gums. If it does, try skipping the xanthan gum next time. When gums mix with water, they form a gel. If you have too much gum in your dough, it will take on a gummy or slimy texture.